March has been one of those crazy months and I have been involved in finalising projects and training a new HR Manager to take over my position. Just dealing with the last days in the corporate world has taken its toll physically, mentally and emotionally. Anyway the consequence of this transition has resulted in the Axis Mundi going out later than usual, for which I apologise. So now that we have reached the Autumn Equinox this celebration reminds us about the importance of bringing balance into our lives. It is also important at this time to remember that the only constant in life is change. Life can and does present us with a variety of tragedy, mediocrity and fleeting moments of joy. Our thoughts of course at this particular time go out to those victims of the recent disasters and we should be encouraged to send out healing and assistance to them at this time of need. We all long for some way to make sense of disasters like what's now happening in Japan, especially with the added problem of the nuclear reactors, and there is a feeling of urgency to say something -- anything! -- that might help. It's very difficult to know how to begin. None of us can claim to have previously experienced anything quite like what our planet is going through. While we have no control over the planetary and universal shifts, we should ensure that we live each day as it comes and learn to appreciate the bountiful harvest of wisdom, love and friendship. The ideals of Leo and Aquarius came into their fullest expression at this Leo Full Moon and it represented a challenge to those who attended on the night on how fully each one was expressing their life purpose. At this circle we connected to Asherah in her lion Goddess aspect. Asherah was a beloved household Goddess of the Hebrews and the Canannites. 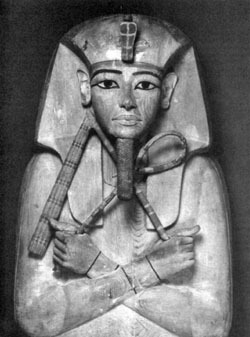 She was the Goddess worshipped by King Solomon, and was known as "Qaniyatu Elima" "She Who Gives Birth to the Gods." There was great power and strength in the lion's energy during this full moon. Under Asherah's guidance we were being asked to utilize this energy and stand in our own power with greater control and discipline. 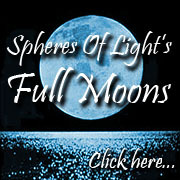 This powerful full moon required us to nurture and take full responsibility for all of our creations and actions. The dragons were summoned to bless, cleanse and sanctify the circle, the Watchers were then called by the power of each element to protect and charge each quarter of the circle. 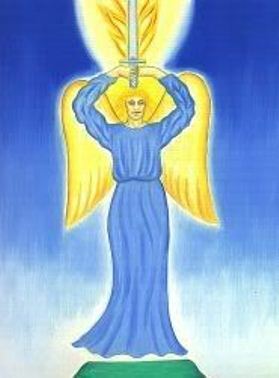 Asherah, the ancient Goddess, the Shekinah was invoked to show us how to stand in our power. El the Old One was asked to help us learn our truth of who we are. We were then taken on a meditation to meet Asherah and El. Guided by a dove we were led down a processional path guarded by ancient stone Gods & Goddesses of different pantheons. The dove then led us to a temple where we were greeted by our hosts and ushered into a room in the temple where we viewed moments in our life where we had failed to stand in our power. Asherah & El then gave us words of confidence to enable us to stand in our power. We were then led out of the temple and once again we journeyed down the processional path but this time we were led by a majestic lion. 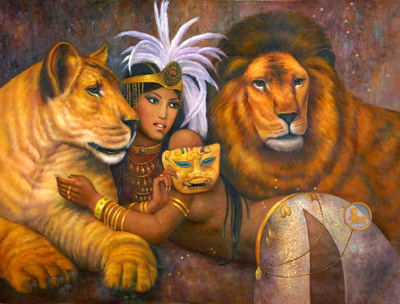 As we were leaving the meditation the lion merged with our being and we took on the attributes of the lion. After the meditation we then enacted our power by taking steps towards the altar stating that we were standing in our power. Once we had reached the altar we yelled out our name three times. We all had a group hug and then thanked Asherah & El and closed the quarters. The residual energy was then grounded back into the earth and forwarded to individuals for healing. The circle was closed and then we all finished the evening with our usual supper. More information regarding this circle and past circles can be found in our Book Of Shadows. 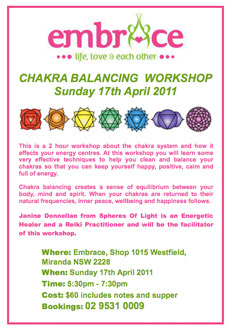 Our next Full Moon Circle will be held near Engadine on Friday April 15, 2011. Please contact us for further details if you would like to attend. The National Pagan Directory (NPD) now has a user friendly "Australian Pagan Events" list hosted on the Spheres Of Light Forums. 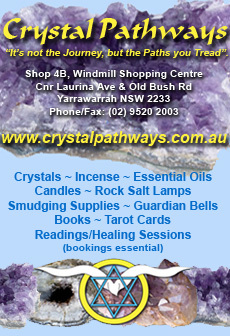 There you will find workshops, classes, special events & retreats which are one-off events or held on a very occasional basis, and also overseas tours organised by Aussie Pagans. 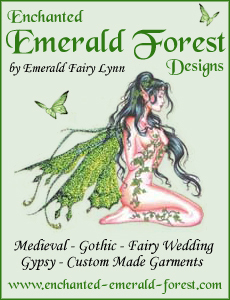 We'd like to encourage everyone to add their pagan events to this list. To do this just sign up to the SOL forums (click on "Register" at the top right of the forum page) then add your event information to the appropriate state list. Once signed in you will also be able to edit or delete your own entries as necessary. Photos/banners/posters etc may also be added to your event entry if you use Photobucket (or similar) to host your images. 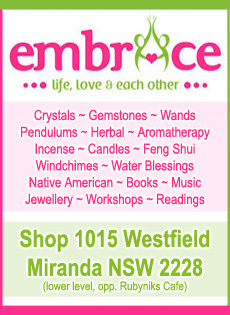 Regular meet-ups such as "Pagans in the Pub", Full Moon circles, and general contact details can still be found in the NPD state listings on the main NPD website, along with listings of Australian Pagan Businesses & Services, Celebrants, Magazines & Newsletters. Please read the Submission & Contact Details if you wish to submit information to any of these categories on the main NPD website. Crone and Sage was born as a result of online discussions about an article, The Invisible Generation - Pagan Elders, which was first published in the February 2011 Axis Mundi. Evidently the article on Elders has been the topic of much discussion both on and off line. In fact there were quite a large number of people who felt that older pagans have either become invisible to the community or have at times been treated disrespectfully. Many points of view were expressed in a closed women's group on Facebook and a few opposing views expressed in the public Facebook. Also a few private posts of varying views had been received. However, it would have been great if we had received more opinions from the men in our community. "I agree and I believe through showing patience and respect with the very young that we nurture the kind of trust and respect that over time blossoms into a reverence or at least healthy regard for our elders, the instances of young people even having consistent access to their elders now is less common. However, because I think it's important particularly for our young women to grow up respecting the crone, partly for their own sakes because otherwise when they inevitably reach that age themselves they'll have no respect for their own power. Also, on a general note it takes a lot of perseverance and hard work just to make it through life to 'crone-hood', that in itself deserves a little respect I reckon." "I have always sought the wider link with other pagans in the community trusting in tolerance and understanding; but I have not found it very often. While I cannot agree that I personally have been shown disrespect [would they dare I wonder :)] - I have found a change in attitude towards the wizened crone over recent years. As a young witch I sought the knowledge of the crones - now it appears some of our younger initiates wish to teach the crones." "I wonder if any of those who feel no link with the crones, have ever considered just how much power we have at our disposal. I am a much stronger witch now than I was thirty years ago. Crones have much to offer to those willing to listen and to ask." "I see the Elders of Witchcraft in particular being those who have had magickal experiences and knowledge for many many years, have travelled and worked with many different people and then hand down these teachings to the younger generations. I have personally met three of these people and I will always hold them in high regard and have the deepest respect for. And on respect, I know that a former and brief coven member was very disrespectful to an elder who had handed down teachings and traditions to them and whom they had never actually met, so I have seen disrespect shown to the elders even by those who are apparently seeking magickal knowledge.I think it shows a lack of respect in themselves and to the craft when people do this." From the opinions gathered an idea was put forward that perhaps a project could be started where the stories of elder Pagans (and Pagan Elders) could be collected and published online. 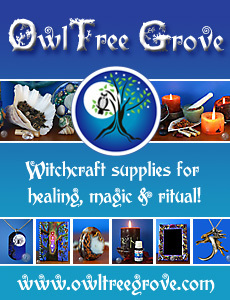 This suggestion was met with enthusiasm by many people, which led to the creation of the Crone and Sage website. The Goddess Sophia is sometimes known as the 'Mother of All' or more commonly known as 'Wisdom'. According to Gnostic tradition Sophia was born of silence and was the feminine figure akin to the human soul, as well as coexisting as the feminine aspect of the Divine. Unfortunately by the year 200AD, all the feminine imagery of God that was part of the Gnostic tradition had been excised from the orthodox canon of their teaching, and until recent times very few people knew that some groups of the early Gnostic tradition had an actual icon of the Divine Mother. Sophia was thus removed as co partner of God and was designated as the Holy Spirit aspect of the Trinity with the dove as her emissary. the hours of day and night are balanced." 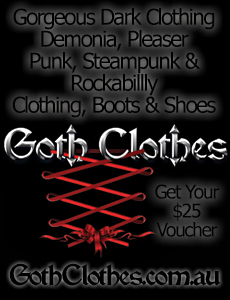 This Sabbat is a celebration of Second Harvest and the Mysteries. 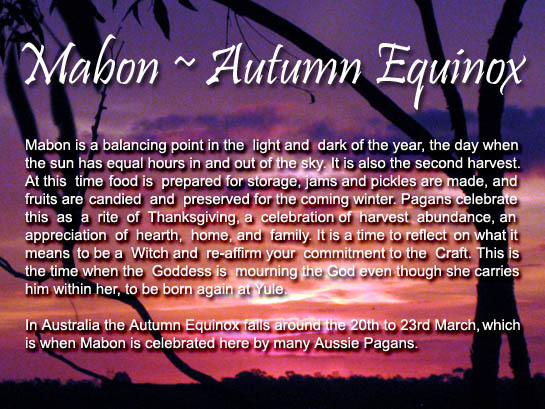 Mabon (May-bawn), the Autumnal Equinox marks the change of season, is also known as the 'Feast of Avalon' and the 'Festival of the Wine Harvest'. To the Celts, Avalon is the mysterious place for the land of the dead and literally means the 'land of apples'. Thus, this is a holiday for celebrating the bounty of the harvest and the desire for the living to be reunited with their deceased loved ones. This, the second of the Harvest Festivals, is the Pagan rite of thanksgiving, also known as "Harvest Home." It's a Sabbat of celebration for the abundance of the harvest; a time meant for us to give thanks through song, dance, and feasts. This is a time of balance, when day and night are equal once again. There may be a hint of sadness within us now, an inner sense of fear and trepidation, as the world begins to tilt toward the time of darkness. And so this Sabbat is also a time of meditation and introspection; a time to slow down the pace of our lives and to relax and recognize our own personal harvests during the year that is fast declining. It's also a time to appreciate the connection we have with those around us, as well as those who have gone before us. While the name "Harvest Home" is often ascribed to the fact that the crops are being gathered, it also references the sense of "community" that this harvest festival fosters, for it's through our kinship with those close to us that we endure through the long, dark, cold nights of winter when the nights become longer, and days become shorter as the wheel of the year moves into autumn and towards the dark winter months. While it is a time of celebration it is tinged with an air of sadness that colder days are on the way. Mabon is a Welsh name meaning "great son," and refers to the Son of the Great Mother, The Divine Son of Light. Mythologically this festival celebrates the story of Modron, the Great Goddess of the Earth, and the birth of her son, Mabon. According to the mythology, Mabon disappears (or is kidnapped) three days after his birth (thus, the light goes into hiding). Mabon is veiled in mystery in the womb of the earth, here personified as his mother, the Great Protector and Guardian of the Otherworld. Though his whereabouts are a mystery, it is only here that he can once again renew his strength and gain new wisdom in order to be reborn to the Goddess as the Son of Light. This is accomplished at Yule (Winter Solstice), with the aid of the ancient and wise animals: Stag, Raven, Owl, Eagle and Salmon. One can readily see the connection of this myth to the natural events occurring during this time. 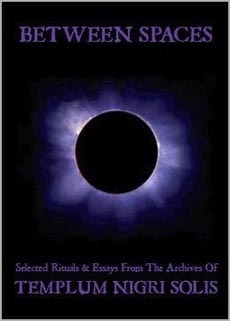 It also speaks to us of the Wiccan Mysteries of Life, Death, and Rebirth, and the sacrificial nature of the God. As a holiday, Mabon also represents the time of honouring the dead, visiting burial sites, giving thankfulness for the end of the harvest season, and the bounty it provides. Although many view the harvest season as a celebration of life, it is also a celebration of the cycle of life. One of the old traditional ways is to visit the burial sites of your loved ones, placing an apple on their marker. This represents the promise of the Great Spirits for renewed life. Later, the festival continues with a holiday ritual and ends with the evening in private reflection. It is important for anyone who is practicing a spiritual life to reflect on his or her actions. Record your thoughts, emotions, and experiences. There is no better time to take stock of yourself and your life than during a High Holy Day. Colors: Orange, Dark Red, Yellow, Gold, Indigo, Maroon and Brown. Goddesses: Modron (Welsh) the great goddess, Bona Dea, Harvest Dieties, Persephone, Demeter/Ceres, Morgan(Welsh-Cornish), Epona (Celtic-Gaulish), Pamona(Roman), the Muses(Greek). Gods: Mabon (Welsh) the son of light - lost at Mabon and returning at Yule, Sky Father, John Barleycorn , the Wicker-Man, the Corn Man, Dionysus(Roman), and all wine Deities. Altar Decorations: acorns, pine cones, autumn leaves, corn, sheafs of wheat, candles in deep rich colours, pomegranate, statue of the Triple Goddess in her Mother phase, baskets. Mabon Herbs: Rue, yarrow, rosemary, marigold, sage, Benzoin, saffron, oak leaves. 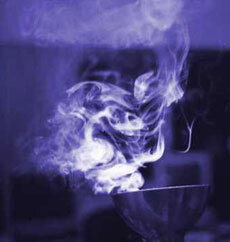 Incense: Pine, Sweetgrass, Sage, Apple Blossom, Cinnamon, Clove, Jasmine. Foods: Cornbread, Apples, Carrots, Onions, Acorns, Seeds, Wine, Potatoes, Wheat Products, Berries, Nuts, Dried Fruits, Squash, Pomegranates. Natural Magic Pamela J. Ball Published 2002. The concept of the Sage and Crone has been all over the web this last month. Facebook and individual blogs have been discussing the merits and titles of the Elders of our community. I know that other writers for Axis Mundi have been discussing the roles of the Crones and Sages. We all meet people who are worthy of the title of Elder. Not because of their great age but because of the knowledge and wisdom they bring. I have meet some people whose knowledge at twenty exceeds the knowledge of another at forty. Age does not necessarily mean wisdom. I would not call myself a Sage just because I am getting long in the tooth. My peers here in many cases are more knowledgeable than I am on their specific fields of study and expertise. In those areas I take the role of student and I am proud to learn. As a Pagan man I look at Paganism from my male perspective and I work with The Horned God and The Goddess in different ways. The Goddess, I look to for healing, insight and Her influence on the world through the phases of the moon. The Horned God, I work with for strength, wisdom and knowledge. In this respect you could call The Horned God my Sage. One of my favorite images that embodies the essence of The Horned God as a Sage is found in Robin Wood's Tarot Deck. This image is of a man in his early forties, crowned with a mantle of horns and offering us his knowledge. So what knowledge does The Horned God offer us at Mabon? March heralds the Autumn Equinox when Light and Dark are balanced, on the Magician card by Robin Wood, we see this in the background. A black candle and a white candle in balance. The Horned God embodies the Sage as he prepares to step behind the veil into the underworld to rule there until the spring. Depending on the tradition that is being looked at this is the time when The Horned God sheds the vestiges of the Green Man and takes up the mantle of protector of the beasts. In either role, The Horned God remains a guardian, protector and Sage at Mabon. At Lammas we gave thanks for the gifts of the crops that The Goddess and The Horned God nurtured and helped grow for us. We enjoy the bounty of the harvest and celebrate the sacrifices of the Gods. Now at Mabon we look closer to home giving thanks for the things and people we have in our lives. We are thankful for the bounty of the season past and while we know the warm days are going to soon fade into memory we have all we need to see us through the dark nights and cold days. 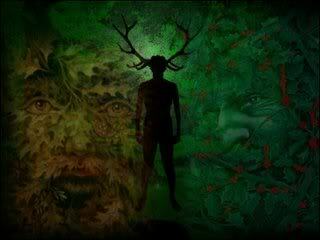 The Horned God at this time watches us as we give thanks and then turns to take up his next role; King of the Underworld, the aging ruler of the world of the dead and guardian of the spirits of our ancestors. Working with The Horned God is for me about tapping into the masculine energies of the universe and the strength and guidance He offers us. Look at the qualities of The Horned God. We are not seeing a feminine being. Warrior, Guardian. Guide. Ruler. Sage. The Horned God is a source of strength and knowledge. Seated on the Throne of the Underworld now, The Horned God's light is weakening in the world above. The seasons are turning. The nights getting longer. The Goddess too withdraws from the world as the lands cool and the leaves drop. This too is the time of the Crone. The Goddess reveals to us the mysteries of the universe. She extends to us insight. The aging Goddess and God are there for us. While the colder weather and waning summer might seem like the Gods are turning their backs on us but this is far from the truth. It is their sacrifice that brings us the harvest. Their wisdom that guides us. Their strength that empowers us and their gift that we understand as magick. Soon enough The Horned God will be crowned King of the Underworld and we will celebrate Samhain. Already we are feeling the first tastes of the winter to come. Around us the signs are there. Leaves are falling. The harvest is done. Now we celebrate the bounty of the past and prepare for the future. Mabon could be likened to the American Thanksgiving Holiday. It is a time to say thank you to the Gods for their gifts. Thank you to family for their love and friends for their support. Celebrate with a meal. Contemplate the people in your life who have been your Elders, guides and mentors when you have sort them to be. So what can we do to celebrate Mabon? For myself I feel it fitting to enjoy a roast dinner. Roast meats, vegetables and favorite foods. Share the meal with those you love and give thanks for them and their role in your life. 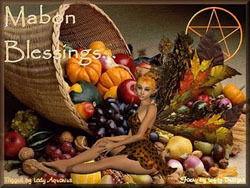 Mabon is about giving thanks for what you have and the role the gods are playing in your life. Merry Meet! 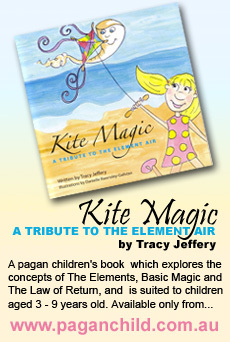 On this issue I interview Tracy Jeffery (left), author of Kite Magic, which is a book for Pagan kids about the Law of Return, the Elements (Air specifically) and Magic. Thank you Tracy for writing the book, it's a fantastic resource for Pagan parents and children. And many thanks also for the e-mail interview! 1. 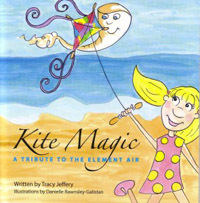 What inspired you to write Kite Magic? Ultimately out of a frustration from not being able to find products, and especially books, for my young kids. I would make up stories for them, and thought I would type them up and stick photos on them and laminate them, then tie them together to make our own books. I thought about importing some books, and distributing them, so I ordered 2 books from USA, by the time the exchange rate and postage kicked in it cost me $75 Aussie dollars for two picture books. It made much more sense to publish my own... and they would be relevant to the Southern hemisphere. 2. What and who influenced you in writing your book? About 20 years ago (when I was in year 12) I started writing my Grandmothers biography. I sat with her for hours and hours carefully writing notes. I haven't published that book yet, it isn't anywhere near finished, and it's a big big job. She had always wanted to publish her story, and I promised her that one day I would. She inspired me to write, to research, and to seek the answers to the problems in life. Half way through the "Kite Magic" writing process I met Amethyst Treleven (Author of "The Seekers Guide" and four other books) quite by accident. She was an incredible inspiration to me in regards to "Kite Magic". She talked me through a lot of the technical stuff, and encouraged me when I thought it was never going to be finished. I have a feeling it would not have made it to the end without her. 3. How has writing your book changed your life and the way you see the world? It hasn't changed my life very much at all really. I have three children under the age of 6, so that keeps me relatively grounded. I did do a guest speakers role at the community centre last week, about being an inspirational woman with in the community. I guess this whole process has taught me that I can do anything I set my mind to (as well as hold down a full time job and have a house full of kids). 4. Do you use this book with your daughters and how? Absolutely! And they were my test subjects too. We talk about the underlying issues in the book, like asking for help (either to other people or Mother Nature) the environment and the elements, and especially the Law of Return. 5. In your book, Alana is taunted by boys and is assisted by her Nanna to call on Air. How would you recommend using the book with boys? The whole idea of the "bad" boys in the book, is there to appeal to the boys too. I hope that the book enables parents and the kids to open up dialogue about the concepts in the book. The boys demonstrate the Law of Return, and the message here for all kids is that what you send out will ultimately be returned to you, good and bad. Bullying is rife in our schools, and boys (and girls) need to realise that it is not okay, and that they should treat people the way they want to be treated. Specifically, I have pointed out to my kids that the boys got "pooed" on because they wished that on someone else, and that they always need to be really careful what they wish for. 6. How do you use the insights of your book in your everyday life? I always treat people the way I would like to be treated. I am always aware of what I send out in to the Universe will be returned to me. I believe in being very careful in what you wish for. Sometimes just thinking about something can make it manifest. I believe in being thankful for the Blessings in life, and that everything in life happens for a reason. 7. 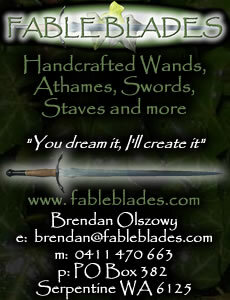 In your website (www.paganchild.com.au) you mention that you plan to write another three books, each dedicated to one element. What can you tell us about them? They are all written, but not in finished form yet. And they don't have titles yet either. My illustrator, Danielle Rawnsley-Galistan, has agreed to illustrate the next three books. As well as an Element, I have tried to put in specific issues into each book that affect children today, and especially Pagan children. I have also tried to make the books as real as possible, so they are not fantasy books, but more lessons in everyday life type of thing. I am hoping to launch the next book in June 2012. It was supposed to be June this year, but time just slips away sometimes, and rather than rush it, I want to enjoy the process of the next book! 8. How do you apply Paganism in raising your children? I am no perfect Pagan, but I do try to imbue my kids with concepts within Paganism when the right situation presents itself. At the moment I tend to talk to my kids a lot about Mother Nature. About the seasons and the cycles, why Mother Nature gives us rain, why she gives us sunshine, and the balance that she brings to the environment. We spend a lot of time in my Dads vegetable garden, and so we like to cook special meals at the Sabbats with the seasonal produce that we have picked. We make sure we thank Mother Nature for the fruit and vegetables that she has grown for us. My kids are still young, aged 5, 2 and 9 months, so I guess how I apply Paganism and Wiccan principals to them will change as they grow up. But most importantly I think, is that my children are aware of the Law of Return. 9. What does Goddess mean to you? Good question. The concept of Goddess is one which changes for me and evolves regularly. I guess for me, it's not exactly about Goddess', but more as God AND Goddess. As a balance and as a duality. That, where there is dark, there is light. Where there is male there is female. That there needs to be balance in everything seen and unseen. And so you can't have Gods without having Goddesses. 10. How did you get into Earth-based spirituality? 11. What would you say a Modern Pagan is? I think a modern Pagan is anyone who chooses to give themselves this title. I don't worry about what titles people take, or are given, or are accused of not deserving. I believe anyone has the right to believe in anything that they choose without fear of being laughed at, criticised or judged! The word Pagan has many different meanings today, depending on who you ask. To me the word refers to the Earth. I would be happy to call any Earth loving people Pagan, but it's not up to me. I am Wiccan but I tend to describe myself as Pagan generally, because I find the term a lot less threatening to people who don't understand what Wicca really is. 12. What is the most important thing for you about your spirituality? This probably sounds corny, but the most important thing about my spirituality is the belief in myself. For me, a pentagram represents, the four elements, and the top point is the mind, and the circle connects them all. To me, this says, "Mind over matter." And reminds me that if I put my mind to something, that I can achieve anything. It reminds me that I am strong, and that I have the Elements on my side to help me achieve all of my dreams. The cauldron symbolizes the womb, and therefore is a symbol of the Goddess. In Celtic lore the cauldron is also seen as a symbol of the Underworld. In modern witchcraft the cauldron is a tool of great importance and has a multiple of uses; it can be used for folk magic, for cooking herbal remedies, burning spell papers, ingredients, and also can be used as a ritual vessel during ceremony. A cauldron can be made of most any material, but cast iron and copper are the most common. You don't need a huge cauldron, a small one of cast iron will be fine. I have a small copper cauldron that I use on my altar. Copper is also a good conductor of energy. 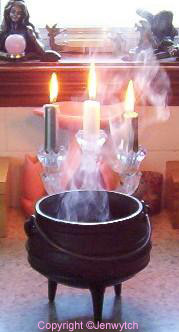 A small cauldron can be better as you will want to move around with it, or place it in the centre of your altar. Depending upon the type of ritual, the Cauldron may also be replaced with a chalice or a bowl. If you are going to be drinking from the Cauldron, then I suggest that a chalice is your best replacement. Cauldrons also make wonderful candle holders, scrying bowls for divination, and are much better for holding liquids because those substances cannot damage a metal container. To create a metal cauldron requires all of the elements in its making. Such a cauldron could be seen as a symbol of the four elements; earth, air, fire and water combined in both function and form. Traditionally the cauldron has three legs; this is seen to be in reference to the Goddess in Her Triple Goddess aspect of Maiden, Mother and Crone. It could also represent three main stages of life; as in birth, life and death. The cauldron is also a symbol of rebirth and to the ancient Celtic people the cauldron was sometimes known as "The Cauldron of Rebirth". The Cauldron of Rebirth appears in the story of 'Branwen, Daughter of Llyr' and was used to resurrect their dead warriors; where they would arise to fight the next day in silence. There seems to be a whole lot happening with the Egypt theme at the moment, everywhere you turn just lately Egypt comes up. Well anyway here goes another moment. What have Egypt and Wicca got in common? Well the answer is a lot. Many modern magickal practices can draw their roots from ancient Egypt. It was known as the "Mother of Magicians". Now where have we heard something like that before? Ancient Egypt culture flourished from around 3100 BCE to around 395 CE when Roman rule ended. But it extends to around 5500 BCE and that does go back a bit, even in the world history time line. The Wiccan practice of the broom to sweep the sacred space prior to ritual and the use of water sprinkled on the floor; these came from ancient Egypt, likewise the use of incense. The Egyptians made use of fragrances in the ritual sense. "It was pleasing to the Gods". The use of knotted threads and ribbons also came out of Egypt; knotted red threads were sometimes called "Anubis threads". They were used for protection from negative forces and entities. Poppets were used for both healing and cursing; the former was used to represent the body of the sick person and the cursing was usually reserved for foreign armies. Colour in Magick - Black was the colour of the night and death, but also for healing. Blue was heaven and water. Green was life and fertility. Red was the colour of blood and fire, but could also represent the sun, danger and chaos. Yellow or gold also represented the sun, constancy and eternity. White was the colour of sacredness and purity. Magickal Tools - Egyptians used a number of different woods or materials for their wands, a different wand was used for different occasions. Sceptres such as Sekhem were used for command, and also to wave over objects for blessing. Postures and movements from Egypt are also used within Wicca, such as the crossed arm position known as the Osiris position. The Egyptians also moved sunwise in their rituals, they believed that to move against the direction of the sun was to give power to the forces of chaos. The use of the sacred circle was a normal practice for the Egyptians. They offered food and gifts to the God, and after they had their share the priests ate there fill. Today we offer cakes and ale (wine) as well to the God/Goddess then we then take part in the sharing of the offering. "Between the worlds" was also used in ritual; time didn't exist within a sacred space. This was because stepping into a sacred space was seen as returning to the beginning of time, to enable the priest to tap into the energies of creation. A final similarity between ancient Egypt and Wiccans is seen in the books of magick (Book of Shadows). 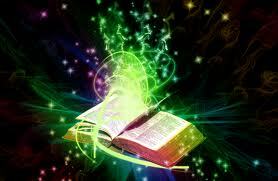 The priests consulted their books for spells, healing and curses. Such spells were usually chanted, generally repeated a specific number of times to have their full efficiency. Ancient Egypt, its religion, culture and legends still hold the mystery of magick with its eternal appeal and old beliefs. May the Egyptian people come through their time of grief and be strong once more to hold their heads up high. So as you can see we as wiccans do share a unique path with the ancient Egyptians that have been left to us all as our legacy to hold and cherish and also pass along as it was passed along to us. Footnote: Tutankhamun and the Golden Age of the Pharaohs will be showing as the next Melbourne Winter Masterpieces exhibition for Melbourne Museum, running from April to November 2011 - www.kingtutmelbourne.com.au. David Rankine from 2007 Witchcraft & Wicca. Vol. 14. This month I've gone nuts again & the funny thing is literally today I was eating a hazelnut torte (yum). 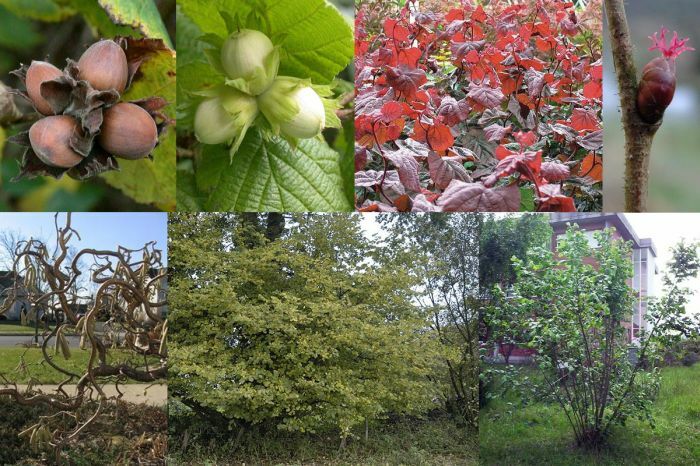 The hazel produces its nuts in autumn/fall, after having spent the year building the inner strength to protect them. The shell of this nut is so hard, in fact, and contains its treasure so well, that is was the inspiration for the phrase "in a nutshell." In England, all the knowledge of the arts and sciences were bound to the eating of Hazel nuts. Until the seventeenth century, a forked Hazelstick was used to divine the guilt of persons in cases of murder and theft. Rose Quartz has been a crystal that I have forgotten to work with for a while. The opportunity presented itself via an angel meditation I am working on. 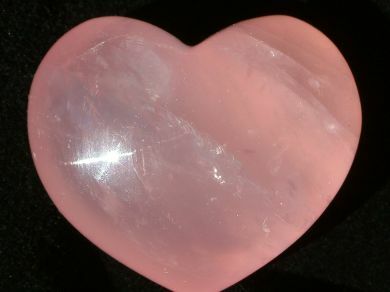 Rose Quartz is a pale to rich pink translucent crystal. It is a stone of emotional healing, especially matters of the heart and is referred to as the 'Stone of Love'. It is a stone of unconditional love, allowing for acceptance of self and others. It opens up our heart to love, in all forms, mental, physical and spiritual, bringing with it an inner peace to our being. The Autumn Equinox/Mabon 'spoke' on the Wheel of the Year has rolled around once again and I've been busy washing, slicing, de-stoning, and stewing plums. 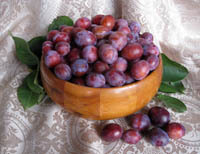 The funny thing was, when my husband came home with a HUGE box of plums after visiting his parents and extended family on a farm in Goulburn, it didn't even occur to me that it was nearly Mabon and that preserving fruit etc from this autumn harvest time was a "very Mabon thing to do". All I could see was a mountain of hard work to add to all the other stuff I already had waiting, but I pretended to be pleased at the prospect of working my way through all 10kg of this plum job. When we examine the Aries ingress chart (click to enlarge) we consider not just the 3 months ahead, but the entire year ahead, as the Sun begins a new round of the zodiac at the zero point of Aries. The Sun shifts from the southern hemisphere to the north, bringing autumn to the south and spring to the north.So when we look at the combinations and planetary aspects of the ingress chart we get an idea of what will unfold, and a flavour of the conditions of the year ahead. This equinox the atmosphere, the condition of the World Soul, is already highly charged. Just as lightning is an electrical discharge that happens in the right atmospheric conditions, the presence of Uranus joining the Sun at this zero point of Aries suggests a year of many new beginnings, great changes and a sense that sudden discharges of accumulated tension are starting to reinvigorate us and call us all to action. The Uranus/Sun conjunction will be in effect for all cardinal ingresses this year as well as for the 2012 Aries Ingress. As planets move over the cardinal points the solstice and equinox positions of the Sun form conjunctions, oppositions and squares to these planets. For the last 2-3 years we have experienced close Pluto/Sun aspects but now we are moving on to close Uranus/Sun aspects. With the Pluto/Sun alignments the world witnessed the Global Financial Crisis and the urge to make our governments, leaders and elite rulers much more accountable and responsible for the troubles the world is facing. Before Pluto, Neptune crossed zero Capricorn back in 1988 with Uranus also crossing this point in 1989, when the world was jubilant in response to the fall of the Berlin Wall and the dissolution of the Soviet regime as many countries rejoiced in independence. Uranus at zero Aries is now the major player, as though a restart button has been pressed and we all move to create significant change in our lives and the world around us. Together with this shift we can see that the nodal points have also recently changed signs. Until now in Capricorn and Cancer, global focus has been on banks, corporations, mortgages, house values, and the reality of the nexus between the welfare of the private household and the decisions of public executives. This has been associated with an erosion of trust in the world of politics and corporate governance as corruption and conflicts of interest become blindingly obvious. The shift to Sagittarius and Gemini moves our focus to principles rather than forms, to ethical issues, truth and justice and how to reform and relearn the universal moral laws which seem to have fallen by the wayside. The mutable signs invite a spirit of review, shaking off the shackles, re-thinking the structures and laws which we assume hold our world together and they represent a great urge for study and enquiry. The north node in the Aries Ingress chart is also conjunct the Galactic Centre, the symbol of our divine source. The Galactic Centre is the centre point of our Milky Way galaxy, kind of like the Sun of our own Sun. Some consider it to represent the evolution and expansion of our planetary consciousness, or the point which represents our planetary connection to the greater truths of the universe in which we are embedded, but of which we may be ignorant or which we refuse to acknowledge. Interestingly the last time the north node was conjunct the Galactic Centre at an Aries Ingress was in 1918 just as peace came to the world following the Great War, and League of Nations was established. The Moon at 17° Libra just past exact fullness, suggests diplomacy, a striving for justice and peace and an urge to create better standards; the conjunction with Saturn lends a serious tone, a stern demanding attitude and a willingness to endure difficulty or setbacks, reflecting a world of people not letting go of what they believe is right. Jupiter and Mercury in Aries oppose this Moon and Saturn, and Jupiter and Mercury now being the nodal rulers, are also off to a new start, new beginnings, new initiatives in humanitarian and progressive directions, but the Moon and Saturn seem to hold back these fresh bursts or energy, or challenge them to be more serious and lasting, as we can anticipate a world progressing with caution and a sense of trepidation, perhaps with many delays or setbacks. This may be generally perceived as frustrating given the tremendous impetuosity of the Uranus/Sun conjunction. The Jupiter/Saturn cycle is now close to culmination (full opposition occurs on 28 March 2011 (UTC)). The position of the last conjunction of the chronocrators - which is what Jupiter and Saturn have been known as since classical times, the planets which mark time - in the year 2000 at 22° Taurus is now being squared by Venus at 22° Aquarius, suggestive of a reminder of the worth of the world's resources, how we value what we have, and what we give and get in return. Perhaps an Aquarian detachment is required to understand that, as a group, as a species, we can't continue along this road of greed and overconsumption, but would fare better to apply the principles of the Aquarian ideal: community, sharing, and radical solutions to common problems. Mars is in Pisces - never underestimate Mars in Pisces! Although often characterized as an energy more willing to give up, than to stand up for itself, Mars in Pisces in fact raises strong passions, urges and needs and if repressed it will eventually blow out, up or through somehow. Mars in Pisces fights hard, strong and long for what it believes in, albeit not always directly. Although preferring peace, Mars in Pisces will often stand up for the underdog, the repressed and the forgotten and has a great ability to pay attention to many things quite often unseen, neglected and covered up and urges us all to do what we can from behind the scenes, covertly if we have to. Jupiter and Mars are also at perihelion, i.e. at the position in their orbit closest to the Sun and have a mutual respect for each other, being in each other's signs. Jupiter in Aries gets on with expanding the mission, as Mars in Pisces seems to make sure some things aren't left behind or unfinished and urges us to consider if we are forgetting something. Jupiter in square to Pluto depicts a world faced with trying to believe in transformation, letting go and moving on in a whole new light, but there is fear and much doubt involved; believing is hard, believing that all will be OK is hard, as we continue to distrust the powers that be. There is a sense of major political developments occurring, but their development is not straightforward by any meansThere is always reason to believe in the future and our common goals, however. Fearing the future will inevitably lead to disaster and things falling apart; positive energy on a personal level does wonders for an individual and so on a collective level being positive and sticking together will help get us through. Mercury goes retrograde on 28 March 2011 (UTC) at 24° Aries and returns to 12° Aries before moving forwards once again, all during the next quarter. This Mercury retrograde in Aries, is about making sure that flying forwards has the right momentum, as restless as we may be for change, moving on and forward, some things as usual within Mercury retrograde periods need reviewing, redoing and reassessment. Jupiter flies through Aries and moves into Taurus on 5 June 2011 when we will perhaps begin to see more tangible results to the revolutionary fervour sprouting all over the world. With Chiron now in Pisces, on 4 April 2011 Neptune also moves into Pisces until August 2011; after briefly returning to Aquarius, it moves back into Pisces in February 2012 where it will stay until 2026. The ingress chart for Neptune's movement into Pisces shows an incredible line-up of planets in Aries - so, new beginnings of all sorts are being channelled through the planet of mystery, imagination and hope, and Mercury retrograde at the time of this ingress is a key to understanding that changing our minds as to what is possible can change the world we want to live in. 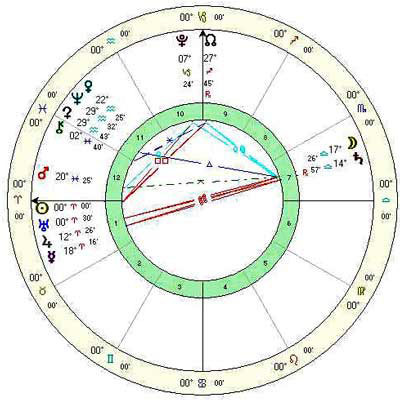 Neptune seems to be a powerful player in what the world will experience in coming years. Playing out its role as the master of shape-shifting and intrigue, the vast oceanic realms of Pisces build no wave breakers or barriers for Neptune and so we may get a sense that all is possible, but all could also be hopelessly lost in chaotic degeneration without care and hope in the possibility, or necessity, of a better world for ourselves and future generations. With Chiron and Neptune (soon) in Pisces we can generate the seeds of the future through these two healing and spiritual archetypes, as we consider Pisces the phase of the zodiac where the seed of future growth and potential is germinated, only to shoot through to surface manifestation in Aries. What sort of seeds are we sowing? Intelligence, fear, love, envy? Everything a plant needs for its future growth is contained in this seed and what grows from this seed is a result of what the seed is infused with. This is our call now, with Neptune and Chiron in Pisces, to infuse the seed with love and healing and a great respect for the place we call home and paying great attention to the environments in which we rear our children. 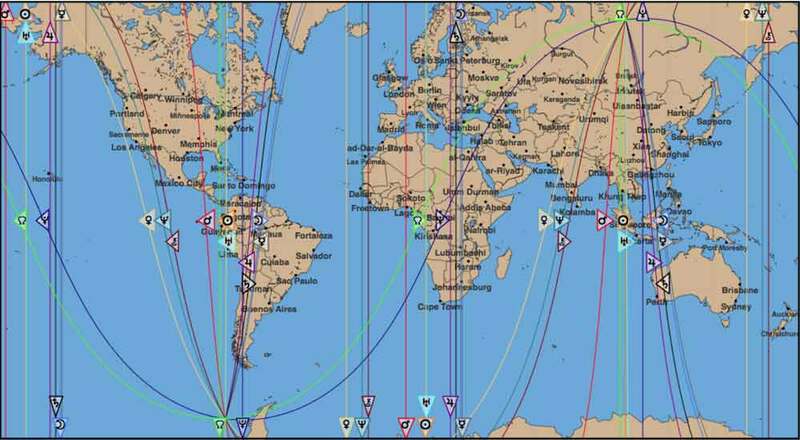 At the exact time of the Aries Ingress,(map above) in a similar way to eclipses and full moons, it is interesting to look at the 'hot spots' of global activity highlighted on the astrocartography map. We can see that the Sun and Uranus are setting in Washington DC, and are anti-culminating along the Libyan/Tunisian border. Also, Pluto is rising through Sudan, Egypt, Palestine, Israel, Lebanon, Syria, Turkey and the Caucasus. So as we move into an intense year ahead, try and retain a firm stance with faith and hope in the future and believe that we can and will get there. See how you can participate in the changes necessary in the world as we move collectively into a healthier, happier, and more peaceful and fulfilled connection to our planet and to each other. Ah decisions, decisions, we have come to a point in time, an appropriate point of the year when we need to take a realistic view of our life. Instead of looking at the details take one step back and take a good hard look at the whole pattern that is emerging. Are you happy with how it looks so far? Does your life need a total overhaul or just a bit of rearranging? The next thing to do is to ask yourself is the ego getting in the way of your development? This card encourages you to deal with your ego so that you can embrace the rebirth of the wisdom aspects of yourself. This is a good time to push for change, to leave behind old patterns or ways of life that no longer serve you, and to move towards the new with an increased awareness of yourself. Changes have already taken place within you, and you can build on those changes and allow yourself to joyfully enter a new phase of your life. The Judgement card is not about second guessing a situation or relying on your perceptions, it is about learning the ability to analyse, to discriminate, and to act detached on the insights you have gained. You can now move towards that which supports you, and leave behind that which hinders you. You can now experience an increased sense of clarity, which will inspire you to move forward with joy and confidence. 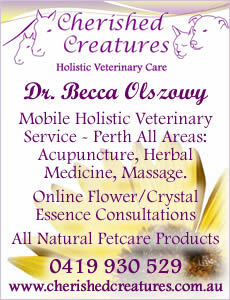 The article above is by Belinda Connolly from St George and Sutherland Shire Leader, Thursday February 17, 2011, p.18. 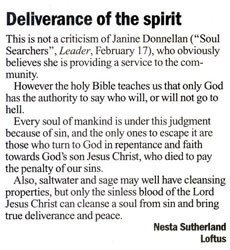 Deliverance of the Spirit (below) is a Letter to the Editor written in response to the article above and was published Tuesday March 1st, 2011, p.7 in "Your View" in the Leader. 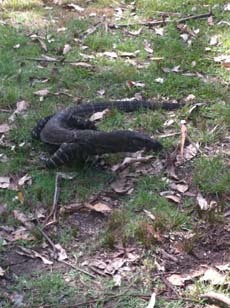 After our previous meditation we were visited by a large goanna who wanted to share our breakfast. It was possibly a Lace Monitor (Varanus varius) -- a species which is known to frequent picnic spots to scavenge for scraps. Traditional Chinese moon cakes are round like their namesake and are usually filled with red bean paste, lotus seed paste or coconut. 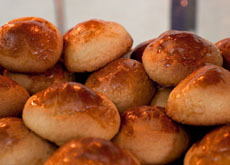 This non-filled version is crunchy and sweet, and a little more familiar to our Aussie palates. Cream the butter and sugar. Stir in the egg, add the flour, salt and vanilla extract, then let chill for a few hours. Preheat oven to 180 degrees. Roll out the dough to 1/4-inch thickness and cut out circles with a 71/2-8 cm cookie cutter. Bake 8 to 10 minutes or until just brown. Frost when cooled and sprinkle grated coconut on top, if desired. Makes 4 to 5 dozen cookies. Preheat oven to 180. 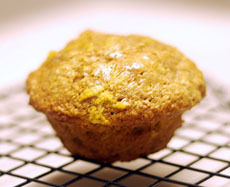 Prepare muffin tins with cooking spray and flour. In a mixing bowl, combine pumpkin, applesauce, whipped egg whites, and juice. In another bowl, combine sugar, flour, baking soda, baking powder, salt, ginger, and nutmeg. Mix wet ingredients with dry ingredients just until moistened. Fill muffin tins 2/3 full. Bake for 25 minutes. Sprinkle with cinnamon sugar as soon as you take them out of the oven (or before) if you wish. A thick and spicy soup that will warm you up this Autumn, made with butternut pumpkin and potatoes. First, bake the pumpkin. Preheat your oven to 180C. Add a little water to the bottom of a baking dish and place pumpkin halves face (cut side) down. Bake for 40 minutes or until the pumpkin flesh is really soft. Let cool a little, and then peel. In a large pot, melt butter and sauté onion and garlic until soft. Add the chicken broth and potatoes, then bring to a boil. Cook until the potatoes are getting soft (about 15-20 minutes). Add the pumpkin to the mix and mash until lumpy, using a stick blender in the pot or move soup to a food processor, puree the mixture until smooth. Pour back into the pot, if you used a food processor. Add seasonings, sherry and cream and stir through. Heat soup but don't let it boil. Once hot, it's time to serve. Burn this incense for the second Harvest. Great for meditation and comtemplation.